Therapeutic use of herbal cardiac glycosides continues to be a source of toxicity today. For example, human toxicity resulted when D lanata was mistakenly substituted for plantain in herbal products marketed to cleanse the bowel. Cardiac glycosides have been also found in Asian herbal products and have been a source of human toxicity. Toxicity may occur after consuming teas brewed from plant parts or after consuming leaves, flowers, or seeds from plants containing cardiac glycosides. Significant toxicity usually is a result of suicide attempt or inappropriate self-administration for the therapeutic purposes. See 11 Common Plants That Can Cause Dangerous Poisonings, a Critical Images slideshow, to help identify plant reactions and poisonings. For patient education information, see the First Aid and Injuries Center, as well as Poisoning, Drug Overdose, and Activated Charcoal. More than 200 naturally occurring cardiac glycosides have been identified. These bind to a site on the cell membrane, producing reversible inhibition of the sodium (Na+)-potassium (K+)-adenosine triphosphatase (ATPase) pump. This increases intracellular sodium and decreases intracellular potassium. In myocytes, elevated intracellular sodium concentrations produce increased intracellular calcium concentrations via an Na+ -calcium (Ca++)-exchanger. In response to the increased intracellular calcium, the sarcoplasmic reticulum releases additional calcium intracellularly, resulting in depolarization of the cell. As a result of this excessive intracellular calcium, enhanced cardiac contractions, which are delayed after depolarizations, occur. These clinically manifest as aftercontractions, such as premature ventricular contractions (PVCs). Cardiac glycosides also have vagotonic effects, resulting in bradycardia and heart block. Inhibition of Na+ -K+ -ATPase in skeletal muscle results in increased extracellular potassium and contributes to hyperkalemia. Cardiac glycosides primarily affect cardiovascular, neurologic, and gastrointestinal systems. Of these, effects on the cardiac system are most significant. The pathophysiology that produces cardiotoxicity involves prolonging refractory period in atrioventricular (AV) node, shortening refractory periods in atria and ventricles, and decreasing resting membrane potential (increased excitability). At therapeutic doses, cardiac glycosides also may increase inotropy. Any dysrhythmia characterized by both increased automaticity and depressed conduction is suggestive of cardiac glycoside toxicity. More than a single dysrhythmia may be present. Progression into a rapidly life-threatening rhythm, such as ventricular tachycardia, may occur abruptly. Exposure to plants containing glycosides can occur through ingestion of sap, berries, leaves, blossoms, or seeds, or of teas brewed from plant parts. Plant extracts also have been intentionally injected. Other implicated routes of exposures, perhaps more folkloric than well documented, include drinking water from a vase that has held lily-of-the-valley, eating food prepared with or stirred by poisonous plant parts, and inhaling smoke from burning plants. Deliberate ingestion of yellow oleander seeds (Thevetia peruviana), known as "lucky nuts," is a popular method of self-harm in northern Sri Lanka. Thousands of cases are reported yearly, with a case-fatality rate of untreated patients ranging between 5% and 10%. Exposure rates may be higher in countries or communities that rely heavily on folk or herbal medicines including plants containing cardiac glycosides. Unintentional ingestion of plants containing cardiac glycosides rarely results in death. However, other plants capable of inducing a similar syndrome of cardiac toxicity (eg, aconite) have been responsible for deaths after ingestion. When death occurs, it generally is due to lethal dysrhythmias and refractory hyperkalemia. The magnitude of hyperkalemia is predictive of outcome. 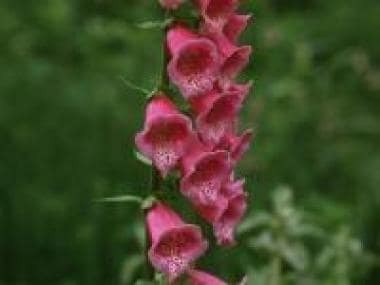 Factors increasing morbidity and mortality are similar to those affecting digoxin-poisoned patients and may be divided into host-specific and plant-specific categories. Host-specific factors include advanced age, renal impairment, myocardial ischemia, hypothyroidism, hypoxia, and electrolyte abnormalities (eg, hypokalemia, hyperkalemia, hypomagnesemia, hypercalcemia). Plant-specific factors include species, part ingested, specific type of cardiac glycosides contained in the plant, and concentration of cardiac glycosides. The AAPCC noted moderate-to-major morbidity in less than 2% of cardiac glycoside–containing plant exposures. In contrast, moderate-to-major morbidity occurred in 48% of pharmaceutical cardiac glycoside exposures. In part, this may reflect lower concentrations of bioactive cardiac glycosides in plants. In addition, pharmaceutical exposures generally occur in an older population (>60 y) and more often are due to intentional ingestion. Most plant exposures occur in children younger than 6 years and are usually unintentional and without associated significant toxicity. More serious toxicity occurs with intentional ingestions by adolescents and adults. Oerther SE. Plant poisonings: common plants that contain cardiac glycosides. J Emerg Nurs. 2011 Jan. 37 (1):102-3. [Medline]. Gowda RM, Cohen RA, Khan IA. Toad venom poisoning: resemblance to digoxin toxicity and therapeutic implications. Heart. 2003 Apr. 89(4):e14. [Medline]. Bessen HA. Therapeutic and toxic effects of digitalis: William Withering, 1785. J Emerg Med. 1986. 4(3):243-8. [Medline]. Eddleston M, Ariaratnam CA, Sjostrom L, Jayalath S, Rajakanthan K, Rajapakse S. Acute yellow oleander (Thevetia peruviana) poisoning: cardiac arrhythmias, electrolyte disturbances, and serum cardiac glycoside concentrations on presentation to hospital. Heart. 2000 Mar. 83(3):301-6. [Medline]. Hack JB, Woody JH, Lewis DE, et al. The effect of calcium chloride in treating hyperkalemia due to acute digoxin toxicity in a porcine model. J Toxicol Clin Toxicol. 2004. 42(4):337-42. [Medline]. Roberts DM, Buckley NA. Antidotes for acute cardenolide (cardiac glycoside) poisoning. Cochrane Database Syst Rev. 2006 Oct 18. CD005490. [Medline].